A seasoned trailblazer’s intrepid trek across the Arctic tundra. After a 2,000-mile journey tracing the equator through the virgin jungles of Amazonia in 1999, South African-born Horn, quite the impatient, antisocial outdoorsman, set his sights even higher: tracking the expanse of the Arctic Circle in 2002-2003. Before his groundbreaking mission, the radical adventurer embarked on two preparatory apprenticeships. A trip across Greenland with two experienced Swiss explorers was cut short by an obligatory in-person acceptance of the Laureus World Sports Award for his equatorial expedition. A solo hike to the North Pole, supplemented with vital guidance from renowned Norwegian explorer Borge Ousland, proved to be a much more treacherous jaunt than imagined; Horn was rescued from the Russian tundra with three frostbitten fingers. Four months later, against doctor’s orders, the determined, obsessed wanderer headed toward the Arctic Circle, armed with experience and enhanced equipment. By foot, on skis or by kayak, he rushed through quaint villages, making friends and fond memories. 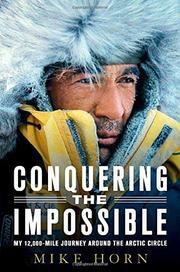 Again he was at the mercy of harsh elements: ferocious winds, whiteout conditions, hungry polar bears, wolves and temperatures dipping to 98 degrees below zero. Horn’s raw, unfettered prose will hold readers in an apprehensive embrace as he describes risking life and limb to scale deadly frozen terrain. Adventure extremists everywhere will be grateful for this vivid depiction of a one-of-a-kind quest.